Writers are often warned to use exclamation points very sparingly. In fact, some say that every writer should only be issued three to use for that writer’s entire life! Whoops, there’s one! OMG…now I’ve used up two! No, three…I haven’t even started to rave about a plant and I’ve squandered my life’s quota. Using this punctuation mark frugally is good advice. When overused, the exclamation point makes a piece sound overly perky or so unbelievably enthusiastic that it becomes far-fetched. This piece from the New York Times makes the case for restraint very well. Unlike novels, press releases and blog posts, gardens benefit from a sprinkling of exclamation points. So many plants are rounded and finely textured that some upright elements are needed to break up the monotony of curves and small green leaves. There are a few perennials that can function as upright elements and this summer I’ve fallen in love with a new one. Last year I received a trial Kniphofia ‘Mango Popsicle’ from Terra Nova Nurseries and as of July first I’m officially in love. I know a plant is a success when I start to make plans to move it from my test gardens down into “prime time.” I can hardly wait to transplant this delicious poker plant into the entry garden…and buy more. 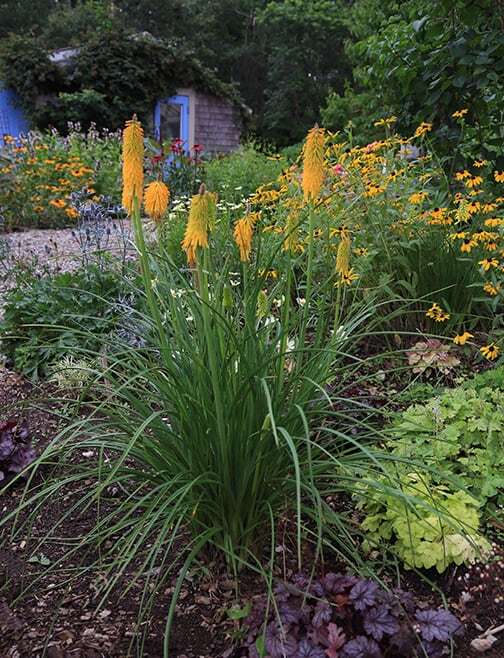 Here's what's special about this particular Kniphofia: it keeps blooming. Many poker plants would stop at the number of flowers that you see in this photo and after three weeks the show would be over. This plant keeps sending up new flowers! Whoops...there's a fourth exclamation point. I've gone beyond my quota, but this plant deserves it. Just as you should restrain yourself from using too many exclamation points when writing, you also want to be judicious when using upright elements in the garden. Too many dilutes the effect. Vertical plants can either be grouped or spaced some distance apart. In general if you clump them together there should be five or more in that cluster. When spacing individual specimens use three or five, never two. Instead of dotting a garden with three or more of the plant it can also be effective to use several varieties that grow to different heights. Use the taller plants about a third of the way into the bed, not on the edges. 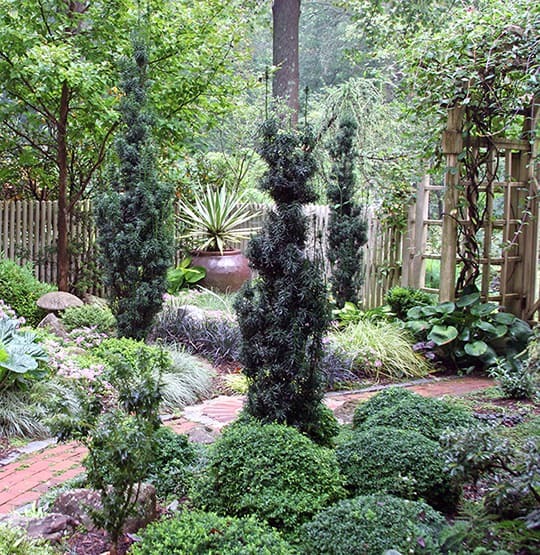 This group of three upright yews make great punctuation points in this restful, green garden. Imagine how this landscape would look without these upright elements...it wouldn't be nearly as exciting, would it?